In forging connections with China, UW-Madison has created an international model for the university. The Innovation Office in Shanghai has opened up new opportunities for students, faculty and leaders in business and government. The Wisconsin China Initiative (WCI) at the University of Wisconsin-Madison is ramping up efforts to engage with faculty and staff across campus to promote interests and coordinate activities in the Greater China region as Nicole Huang, professor of Chinese literature and visual culture, takes over as director. They are all champions, and today, the Wisconsin volleyball team had a chance to meet eight Chinese athletes as part of the UW’s Chinese Champions Program. The eight athletes, including Olympic volleyball gold medalist Yang Hao, were all either Olympians or world champions in their respective sports. University of Wisconsin-Madison Interim Chancellor David Ward is leading a Wisconsin delegation to China, where he will inaugurate UW-Madison's first overseas outpost and participate in events aimed at deepening engagement with Chinese partners. The delegation, which includes UW-Madison representatives along with state of Wisconsin and state business officials, will travel to Shanghai, Beijing and Hong Kong from June 8-20. As China expands its domestic milk production, it will buy more milk products from the United States. That may seem counterintuitive, but it's really just a case of the Chinese dairy industry generating more demand than it will be able to supply, according to an analysis by UW-Madison agricultural economists. Among the hundreds of new graduate students who arrived on campus for the start of the fall 2011 semester, Zhao Jingzhou of Shanghai could claim a unique connection to a special moment in UW-China relations. Mr. Zhao’s grandfather arrived in Madison 32 years ago as a member of the first group of visiting scholars to come to Wisconsin following the normalization of US-China relations. “Those two years in UW-Madison were one of the most precious memories of my grandfather,” Mr. Zhao said. A group of world-class Chinese athletes accustomed to competing on the international stage got a close look at two international stars of Wisconsin agriculture—cranberries and ginseng. The student-athletes in the Chinese Champions Program at the University of Wisconsin–Madison traveled north to broaden their perspective on their host state. 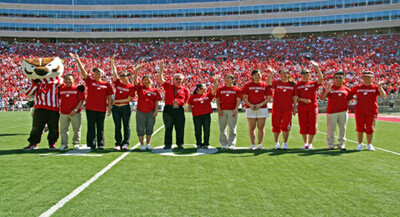 University of Wisconsin–Madison Chancellor David Ward officially welcomed the 2011 class of the Chinese Champions Program to Camp Randall Stadium during the Badgers football game on Saturday. More than 80,300 Badger fans greeted the Chinese superstars, who represented a combined total of more than 12 Olympic and 30 world championship medals. Halfway through the trip, Bousquet reflects on the journey thus far. A group of elite Chinese athletes studying at the University of Wisconsin–Madison got an inside look at America’s national pastime last week – while serving a few surprises for their hosts. Fifteen members of the Chinese Champions Program, visiting UW-Madison for nine months of language and culture studies, attended the sold-out Milwaukee Brewers game against the Minnesota Twins on Saturday, June 25 as special guests of the club. In a surprise clubhouse competition, table tennis player Zhang Yining took on three Brewers. The ten-time world champion traded volleys with All-Star Corey Hart, Cy Young winner Zack Greinke and John Axford. “I’m pretty sure she was just toying with us,” joked Axford. The Brewers featured photos of the event on Brewers.com. Photos used with permission from the Milwaukee Brewers and MLB Advanced Media. For more on this event visit http://milwaukee.brewers.mlb.com. Gilles Bousquet, dean of International Studies and vice provost for globalization, currently is leading a University of Wisconsin–Madison delegation on a two-week visit to China, aimed at expanding and deepening the university’s connections there. The itinerary includes events and meetings in Shanghai, Hangzhou, Hong Kong, and Beijing. SHANGHAI – UW-Madison’s most recent delegation to China, led by Gilles Bousquet, is wrapping up its time in Shanghai with a visit to top universities. At Fudan University, one of China's oldest and most prestigious campuses, Bousquet and Fudan Vice President Yonghao Gui met on Friday, May 20 to discuss possibilities for collaboration between the two universities, particularly in the area of medical research. One such collaboration is already well underway, as UW-Madison professor Jack Jiang, Director of International Collaborative Research and Translational Research for the Department of Surgery, has partnered with Zhengmin Wang, a distinguished Fudan professor of otolaryngology. 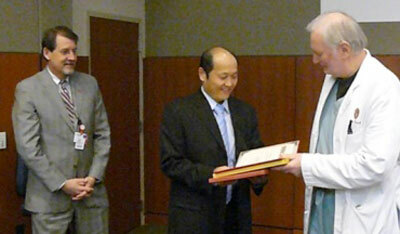 Bousquet presented Wang with an award in recognition of this longstanding relationship. 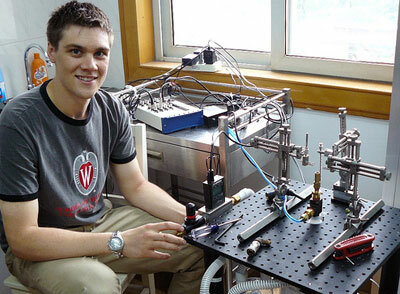 The group also met with Adam Rieves, a UW-Madison bioengineering student spending two weeks in Jiang’s Shanghai lab. On Saturday, May 21, Bousquet and Laurie Dennis, associate director of UW-Madison’s China Initiative, visited East China Normal University. Bousquet had visited ECNU last spring with Chancellor Biddy Martin; in turn, ECNU administrators including President Yu Lizhong visited UW-Madison last September. ECNU specializes in education and currently serves about 4,000 international students each year, including 1,000 from the United States. 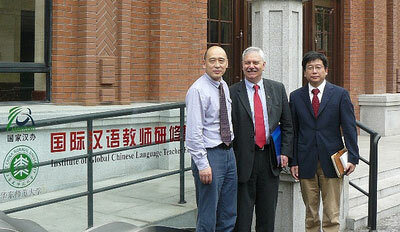 Dean Bousquet (center) toured the recently renovated Institute for Global Chinese Language Teaching at East China Normal University with Vice President Chen (right) and International Exchange Division Director Shuzhe Ding (left). The delegation will move on to Hangzhou from May 24-26. To follow up on Chancellor Biddy Martin’s two visits to China in 2010, a delegation from the University of Wisconsin–Madison’s Division of International Studies is traveling there this month to continue the university’s efforts to expand and deepen connections in this important region of the world. 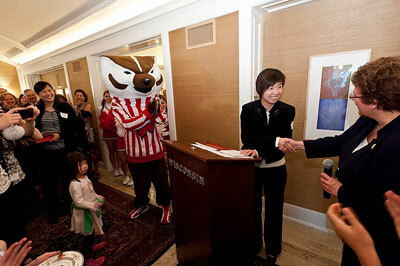 Faculty, staff and members of Madison’s Chinese community joined Chancellor Biddy Martin at Olin House to welcome 15 world-class Chinese athletes, including one coach, to the campus of the University of Wisconsin-Madison. With a visit by the UW Spirit Squad, the atmosphere was light. As kinesiology professor and program coordinator Li Li Ji introduced the athletes, they posed for snapshots with Bucky Badger and flashed “W” with their fingers. Children crowded near the podium as Zhang Yining, a national superstar in table tennis, made brief remarks in English. The 16 athletes of the University of Wisconsin-Madison's Chinese Champions Program stepped off of a chartered bus into a swarm of excited fans — including Bucky Badger himself. Arriving at approximately 9 p.m. on Thursday, March 31, the athletes were greeted by dozens of members of Madison's Chinese community outside the Armory and Gymnasium (Red Gym). UW-Madison students, families and others crowded near the curb with flowers and cameras, hoping to catch a glimpse of world champions such as Zhang Yining and Gong Ruina. Sixteen accomplished Chinese student-athletes, including one coach, will spend nearly nine months living and studying at the University of Wisconsin-Madison. The group, which includes multiple world champions and Olympic medal winners, is the second cohort in the university's partnership with Beijing Sport University, the foremost sports, physical education and exercise science institution in China. Building on the success of last year's inaugural cohort, a second group of elite Chinese student-athletes will arrive at the University of Wisconsin-Madison on Thursday, March 31, as part of the Chinese Champions Program. The 16 athletes (including one coach) will stay in Madison until mid-December as part of a unique exchange with Beijing Sport University (BSU), the foremost sports, physical education and exercise science institution in China. During the spring, summer and fall at UW-Madison, the group will participate in three sessions of a nondegree academic program. The curriculum includes instruction in English as a Second Language and kinesiology, as well as internships focusing on training, coaching and events management. They will also participate in tours and other community activities. Doctors in the University of Wisconsin-Madison Department of Surgery are finding new ways to collaborate with their colleagues at a major hospital in Beijing. The new collaboration was launched in March during a business trip to China by Dr. Bruce Harms, chief of the Colorectal Surgery Section at UW-Madison. Dr. Harms visited Chinese PLA General Hospital in Beijing, a 5,000-bed medical and research center formerly known as the “301 Military Hospital” (PLA stands for People’s Liberation Army). Dr. Harms left Beijing wanting to know more about Chinese PLA’s extensive experience in treating gastric cancer.